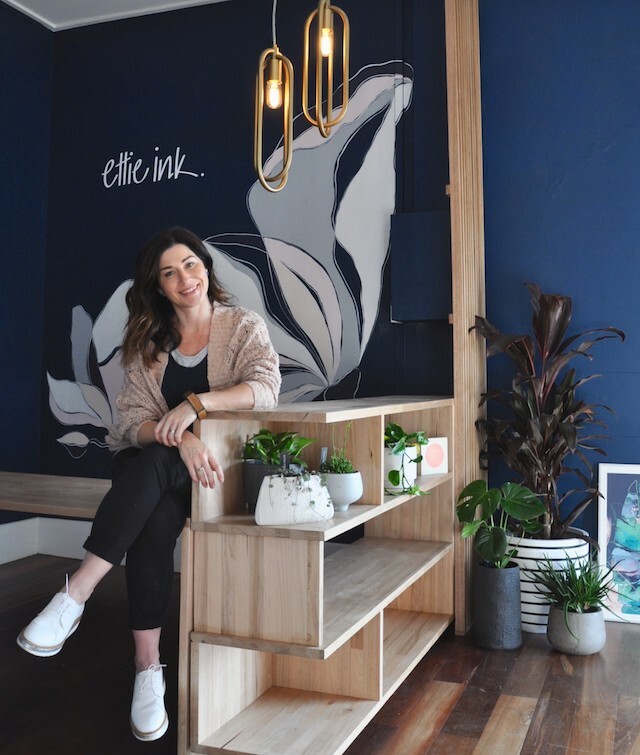 Michelle recently took a leap of faith and opened her own art studio (Ettie Ink) after many years of pondering on the idea. By trade, Michelle is a teacher at St Mary’s College but has always had an underlying passion for art and design. 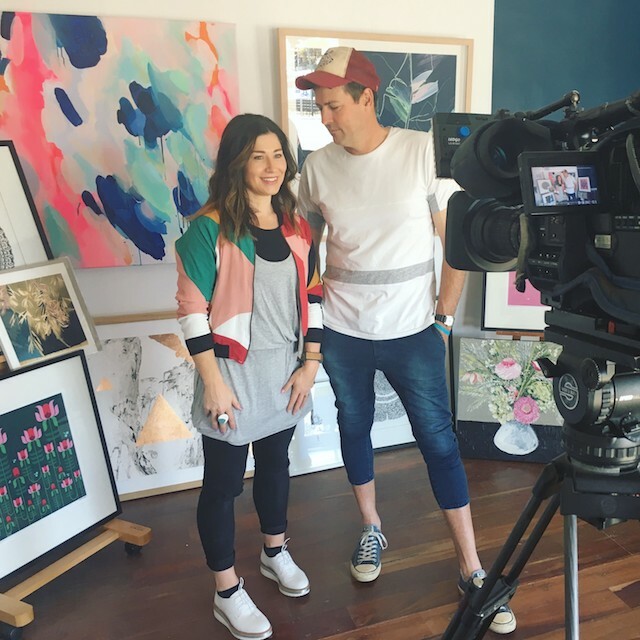 After her appearance on House Rules, she felt inspired to follow her creative flair and have a permanent art space where customers could see her work displayed and styled correctly! If you haven’t seen her work, it’s simply amazing (check it out here). Wow! Your space is amazing – initially your business was graphic design, how did it evolve into art, and a permanent space? Thank you so much! I’m really pleased with how the studio has turned out. Everything pretty much went to plan, which I have to say is a different experience from renovating on House Rules! 😉 Luckily I had more than a week to get it all ready. As a graphic design business, I initially specialised in bespoke wedding stationery. A friend and fellow creative suggested I turn my invitation designs into prints and encouraged me to sell them at a local market. People loved my designs and actually started buying my prints, which was such an amazing and rewarding feeling! I’m still creating graphic art but my goal in the new studio is to get back into painting on canvas, which is something I’ve been wanting to do for quite some time, but didn’t have the space to do so at home. You were on a reality show recently with your Husband? What was that like? Honestly, it was torture! Ha ha. An amazing experience overall, but every last inch of your physical and mental state is tested. You go through extreme highs and lows – the renovations were so stressful, frustrating and emotionally draining. The mental strain far outweighed the physical exhaustion. You’re constantly under pressure, having to make quick decisions with little or no sleep and all the while cameras and producers are constantly in your face, questioning your every move. 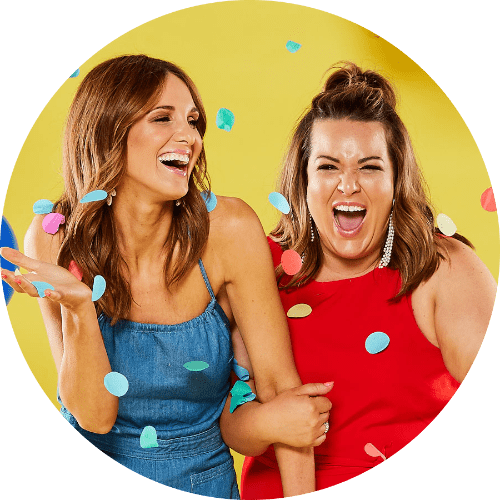 As a perfectionist and someone who usually sets high standards, I really struggled to let go of things – there just wasn’t the time to do things how I wanted to – that was one of the most frustrating parts for me. I am a procrastinator, so having to make quick decisions was definitely my downfall – I normally like to take my time to ensure I’m making the right decision (drives my hubby nuts!). It was really interesting to see how the whole TV production worked and absolutely fantastic to meet the people we did, including the other contestants and the crew. So apart from being lucky enough to have our house renovated inside and out, we have honestly made beautiful, life long friends. It was without a doubt a unique, once in a lifetime experience and we feel extremely lucky to have been on the show. It was an absolutely crazy, surreal, traumatic, fun and incredible experience – something we’ll talk about forever! 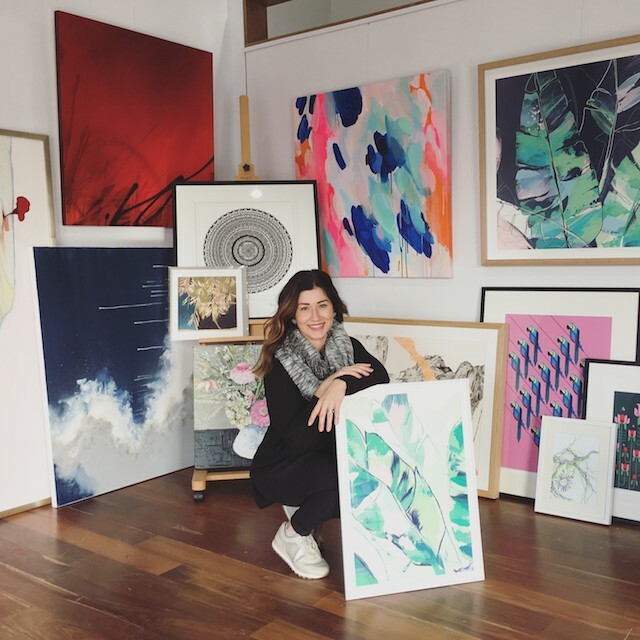 Your art is vibrant and makes me happy when I look at it – where do you get your inspo? I really love it when people tell me my artwork makes them happy, so thank you! I get my inspo from absolutely everywhere! Magazines, fabrics, homewares, architecture, patterns in nature – you name it, I’ll be looking at it to see what design I can create! I often take photos on my phone so I can refer back to things later. I also have sketch books that I draw my ideas in – I’ll sketch something quite a few times before starting a new piece. Sometimes it might be something as simple as a colour combo that inspires a new piece. Does it ever just blow your mind that your pieces are selling out and that people have your creations hanging in their home? Absolutely! Every now and then I have to remind myself that people are talking about ‘my’ artwork! I feel so blessed to be able to pursue my creative dream and when people give me such positive feedback it makes all the hard work worthwhile. I’m so excited that my calendar has sold out three years in a row – I feel like I have my own little following, which is super cool! Something I’m finding is happening more and more is that people are talking about the fact they’ve heard of Ettie Ink or that their friend/relative/colleague has my artwork in their home – it means my artwork and my name is legitimately out there. It’s a very rewarding feeling. What is the best piece of advice you would give to someone who wants to take the leap of faith into their own business? It goes without saying that you have to be passionate and 100% committed. Be prepared to work long hours for little reward to begin with. It’s not just about being good at your passion, you have to be a bit business savvy too – so get help and advice in areas you’re not so confident. Some important advice I was given was to always ask myself, ‘will this job or task lead me closer to or further away from my goal?’ I’ve always found it hard to say no, and when starting out, we are inclined to take any job we can. However, doing all the ‘yes’ jobs can be detrimental and take you further away from what you’re really setting out to achieve. It sounds harsh, but learn to say no. The other vital thing I think is to make sure you have a good business mentor! It can be a friend or a professional, but you need that certain someone to nut things out with and keep you accountable. Oh, and one more REALLY important thing… reward yourself on your successes, no matter how big or small! Where is your fav SA spot to relax and unwind? I would have to say I absolutely love going to Port Elliot and hiring a beach house or staying at the caravan park with our good friends. You feel like you’re getting away from the city, but there are still great cafes and home-ware shops down there, which I love! But basically I love staying anywhere there’s a beach… It’s so relaxing and the kids love it!